Well, here we are again. As part of a charmingly minimalist Sony conference at this year’s E3, Sony confirmed that they’re working with Activision to bring the 20-year-old Crash Bandicoot back to PlayStation. Announced are a remastering of the original trilogy for PS4 and inclusion in Skylanders, only the latter of which was lingered on. But what does this really mean for the future of this orange marsupial? The answer is complicated, but it’s important to keep a level head. Consider this an immediate postmortem that will be elaborated on over time. MORNING ADDENDUM: See “Why?” below. As I’ve covered in my article last year, and as I hope to build upon in the future, the franchise has been through quite a lot of politics. Crash as a character was, of course, intended to be a third-party mascot for PlayStation, but Universal’s hands on the IP meant that once Naughty Dog left the lot, Crash became cross-platform. At the same time, gameplay was kept familiar and straightforward. Crash’s counterpart Spyro was allowed to expand its scope over the years, though Skylanders was the real game-changer once Activision inherited both franchises. Longtime fans may hate it, but it’s now a popular staple of toy aisles worldwide. A few clues come in from the auditorium layout. First off, the track chosen for the heralding was the warp room theme for the third game, Warped. It was recycled for Wrath of Cortex after that and never brought up again. But at the same time, it was the Crash 1 logo gracing the projection screen. Second, no details were mentioned about the remasterings. Through the thunderous cheer, it was only briefly mentioned before moving onto confirmation of the Skylanders rumors. Third and finally, fans have agreed that this new Crash hearkens back to the classic Charles Zembillas designs, close enough to count. All of this reinforces an obvious point: Sony just really needed that 20th anniversary publicity. Activision just wanted to tap into the pockets of the old audience. Whether or not the remasters were ready or even begun was irrelevant, because this one moment (alongside Hideo Kojima’s grand entrance) gave all the buzz anyone standing on that stage could ever want. Also, I admit it - I imagined the actual moment to be more exciting on Sony’s part. 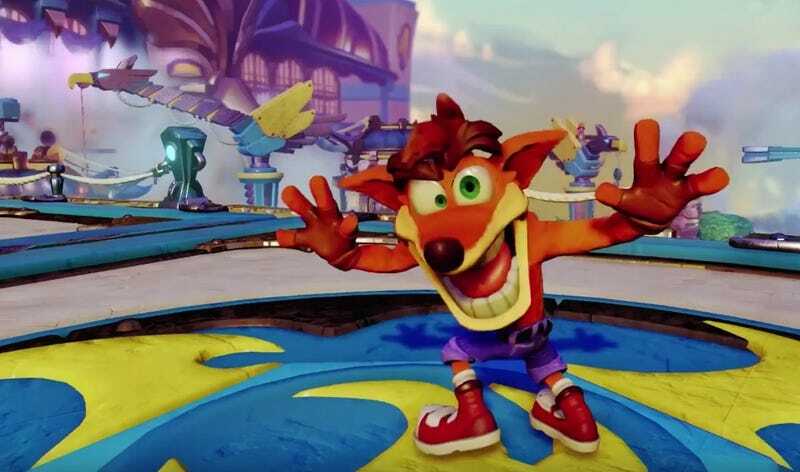 Seriously, just imagine them bringing in an excited and eager lead developer to shout, “Crash Bandicoot is back!” I also would’ve loved for it to be paired with classic Spyro just to flip off Rare. Insomniac is safe though, because they’ve got a Spider-Man game. Only time will tell. Skylanders Imaginators is due in October, which means there’s actual product on hand. Though if you aren’t already on board, you shouldn’t get too eager for that. E3 itself is still going on, and none of the original creative hands (save for Jason Rubin while busy with Oculus) have made any comment as of writing. If more details are made about the remasters come soon, then we can keep the hype strong. As many commentators on IGN and others have said, this is going to be a testing ground for Activision to see if Crash is viable enough to take a full reboot. A reboot, of course, is what we, the fans want. And at this point, we can only hope it won’t be another Crash of the Titans. I’ve seen quite a few comments on other Crash-related articles insisting that Crash is too obsolete, too annoying, and too unremarkable to deserve a reboot. So let me clarify a few things. The original trilogy were very much glorified arcade games, with Warped taking it to its logical conclusion. As before, not terribly complicated, and even we as fans know that. But you know what other character was considered obsolete and unusable for a long while? Rayman. A year older than Crash, the original Rayman was a 2D sidescroller in the last year before 3D began dominating the genre. It took to 3D for its own next two installments, and even had a 4-episode cartoon in Europe, but despite massive acclaim it never really took hold the same way. In parallels to Spyro with Skylanders, Rayman’s first big legacy was the spin-off Raving Rabbids series. The character was quickly and quietly dropped from the billing, and the Rabbids took over for the next 5 years. Not until Rayman Origins and Legends did that franchise get the life it deserved. Taking from the original game’s aesthetic and building on it with strong and uplifting elements made it new, exciting, and above all fun. I bring up Rayman because Origins is exactly what a Crash reboot needs to be an answer to. It needs to have a fresh update to the art style, new ideas for the universe, and solid gameplay. Also, those timed treasure chest levels just evoke Crash’s famous rolling-boulder and riding-animal levels so much. Just think, there could be some percussive music thumping along in tandem with the platforming. Seamlessly! How awesome would that be? Stay tuned, J*Rod is outlining a book on Crash’s place in more than just gaming.